see head bookkeeper; cf. accountant (939). is responsible for incoming and outgoing cash, and for payments into and cheques drawn on bank account; receives cheques and cash daily from counting house and keeps cash book and other accounts required by accountant q.v. ; pays all salaries and commission to members of staff and is responsible for details in connection with National Health and Unemployment Insurance. in consultation with manager, buyer (772), salesman (775) q.v. , etc., collects costs of materials, processes, machinery, power, etc., either singly or in varying quantities, to enable manager or estimating clerk (933) q.v. to quote prices or estimates to customers, to estimate profits, or to come to decisions as to installation of new machinery or introduction of new processes; supervises and is responsible for work of costs clerks (933) q.v. in water board, etc., office, directs the work of clerks (939) q.v. making out rating schedules; sometimes lays down schedules of rateable values, according to reports of surveyors, particulars of rentals, etc. ; answers queries and decides debatable points; may, under direction of secretary (930) q.v. , deal with important correspondence from public and their legal representatives; contests or allows applications for rebates, repayments, etc. ; makes out estimates of yield of rates for board, etc. ; prepares list of ratepayers and amounts due for treasurer. has charge of entire counting house staff; is responsible, through ledger clerks (939) q.v. , for keeping ledgers in which are entered all accounts of goods bought or sold by firm; sanctions all credits; renders accounts for all goods sold and is responsible for collection of all such accounts; prepares daily balance of cash for chief cashier, and deals with correspondence in connection with accounts. has charge of staff of book-keepers (939) q.v. who undertake all necessary work under his instructions; obtains details of all monetary transactions -from ledger clerks and from cashier (939) q.v. ; prepares all financial statements for production of balance sheet by firm of chartered accountants or may compile balance sheet himself; calculates commission due to salesmen (775) q.v. and passes statement of these to cashier for payment. 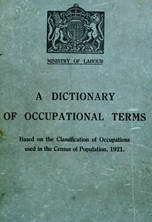 frequently combines duties of head bookkeeper and chief cashier q.v. ; also acts as deputy to manager or -proprietor, answering correspondence in their name, interviewing travellers and callers, etc. ; in large businesses, takes charge of a section of the secretarial or account work or of a department; supervises work of clerks (939) q.v. and is responsible to secretary (930) q.v. or manager of department or firm. prepares schedules of rates for the carriage of goods, decides as to the categories to which certain border-line classes of goods belong, makes estimates, quotes special rates, makes contracts with railway, shipping, or other firms for the transport of goods; negotiates with custom authorities of own and foreign countries; answers correspondence with regard to lost or damaged freight; supervises and is responsible for work of clerks (930) q.v. in department. is responsible for the issuing of tickets to passengers by rail, steamer, etc., and for the proper direction of passengers and luggage over agreed route; negotiates with other countries for the reception, assistance and guidance of travellers or emigrants; frequently obtains accommodation and plans itineraries for journeys; quotes rates and makes estimates for the cost of journeys or tours; conducts important correspondence with intending travellers, deals with complaints, etc. ; supervises and is responsible for work of clerks (939) q.v. in his department. supervisee staff of girls and/or women who open correspondence containing orders; receives sums in stamps, postal orders, etc., enclosed in letters, ana sees that entries are duly made in receipt and cash books; if necessary, -dictates replies to letters or indicates type of answer to be sent; sometimes superintends packing if parcels are small; arranges for posting, etc. ; orders fresh stocks of goods from storeroom or returns surplus goods to storeroom; reports to manager of business. conducts in chambers, usually with little supervision, affairs of employer's practice or of any department thereof; deals with barrister's clerks and instructs counsel; interviews and advises clients in the name of the firm; attends summonses in chambers; generally supervises the work of office staff and conducts legal work on behalf of his principals; is often himself a qualified solicitor, and, as such, may conduct cases in the Courts.